I've already covered Cisco's new "App Enabled" router line and reviewed the EA3500 in depth. So this focus of this review of the EA2700 Gigabit Dual-Band Wireless N600 Router is mainly on how it performs. The EA2700 is the least expensive way to buy into Cisco's cloud-connected future. It is a simultaneous dual-band dual-stream (300 Mbps maximum link rate) router with no USB storage/printer sharing, sitting one step above the app-less E2500 and one below the EA3500. Your extra $10 over the E2500's cost (based on MSRP) buys you Gigabit ports in addition to the EA2700's future cloud features. The EA2700's rear panel has the same ports, lights and switches as the EA3500 shown below, minus the USB 2.0 port. 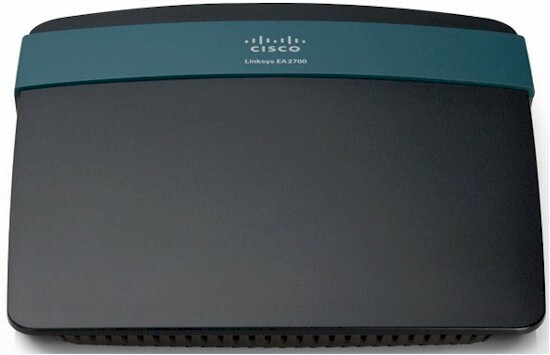 The complete story of the EA2700 and the rest of the new Linksys lineup is over in Inside Story: Cisco Linksys EA Series. But here's a summary comparison. Specwise, the EA2700 lies between the E2500 and discontinued E3200. It lacks the USB port of the E3200, but has Gigabit ports vs. the E2500's 10/100. As Table 1 shows, however, its components have more in common with the E3200's. Note the EA2700 is currently the only Broadcom-based member of the new EA line. Here's an inside shot of the EA2700 with its RF "cans" removed. A full list of features can be found in the EA3500 review. The EA2700 has the same feature set, minus anything associated with USB drive sharing. I've put a shot of the Wireless Settings page below so you can see the basic set of controls provided. As has become the new norm for Linksys routers, there is no "advanced" wireless settings page. I've summarized the options for each radio's settings in Table 2. Note that there is no 40 MHz only setting for the 2.4 GHz radio. The Marvell-based EA3500 and EA4500 also lack the same option. But you'll see shortly that the EA2700 takes its "auto" channel width duties perhaps a bit too seriously.